2017 is off to a great start and what better way to kick off the year than to start talking about this year’s delectable food and wine events that are coming up. 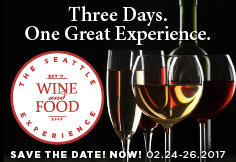 The 2017 Seattle Wine and Food Experience (SWFE) has grown this year into a 3-day festival, offering a full spectrum of Seattle’s culinary and craft beverage scene. Founded in 2009, SWFE has exploded into a premier event that is not to be missed. Under Seattle magazine’s new ownership, the footprint of the event is growing to reach a wider audience and showcase the city through its incredible food and beverage scene. Each event “experience” is vastly different, so you can attend the one that fits your palate, or make a weekend of it and attend all three.